Dr. Félicie Affolter is a distinguished alumna of the College of Liberal Arts and the department of Speech Pathology. After graduating from the University, she earned her license in psychology and a doctorate degree in Speech Sciences. Dr. Affolter has maintained her connection with the University of Minnesota for the last 25 years as a visiting scholar. Dr. Affolter has had a highly productive career in the field of therapeutic methods for autistic and brain-damaged children and adults for more than 30 years. 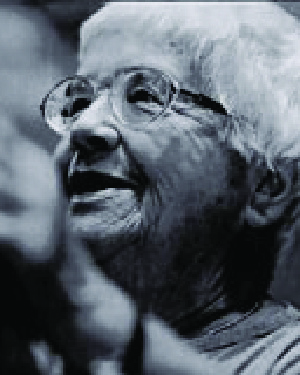 She is most noted for the development of "Guided Interaction Therapy." Dr. Affolter is the founder of the Center for Pedo-Audiology at the Kantonsspital in St. Gallen, Switzerland, and the University of Fribourg, Switzerland. She founded the Special School for Children With Perceptual Disturbances. She is the founder and director of the Center of Evaluation and Treatment for Children and Adults with Perceptual Disturbances. Dr. Affolter has published prolifically and her books have been translated into several languages. She has taught courses in universities and clinical institutions in Europe and the United States. The courses, which have focused on treatment for brain-injured patients, have put her in contact with scholars, parents, and therapists from around the world. She has been a consultant for decades in Switzerland, Germany, and the Scandinavian countries. She has been a regular consultant and adviser to the Burgau Institute for Rehabilitation in Germany since its inception more than a decade ago. It was her intervention approach that inspired the creation of the Burgau Center. Dr. Affolter has earned professional credentials in multiple disciplines that include developmental and clinical psychology, audiology, speech-language pathology, and education. Her ideas and methodology have found wide-ranging support and acceptance in Europe. Her methodology has been a bold attempt to show how development can be facilitated by enhanced somatosensory input during ordinary problem-solving events of daily life. Her intervention approach has been empirically and theoretically grounded by how humans learn generally. That therapy has been broadly applicable to many types of disorders, not just autism, and equally relevant to rehabilitating adults with brain injury. Her theoretical orientation inspired a yearlong symposium on the developmental issues related to movement and action themes in intelligent behavior at Michigan State University. Nine years later she inspired the book, "Movement and Action in Development and Learning: Implications for Pervasive Development Disorders." In naming Dr. Affolter as a recipient of the Distinguished Leadership Award for Internationals the committee cited how her career accomplishments have greatly helped patients with autism, their families, and professional caregivers. The committee was impressed with the longevity of her career and her ongoing connection to the University of Minnesota.